Engraved Carabiner Key Chain with Strap from 54¢, Ready in 3 Days! 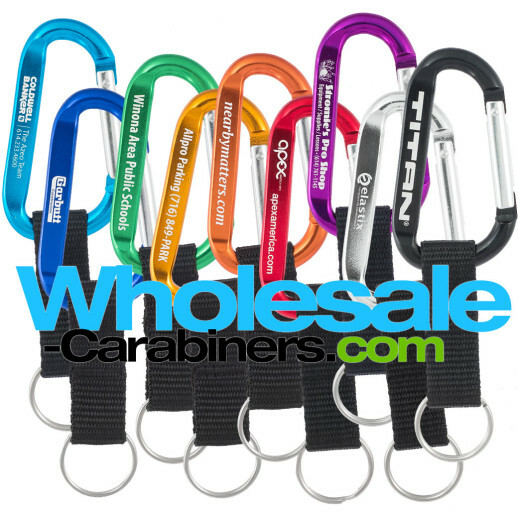 Custom engraved with your promotional message, this promotional Carabiner comes with a sturdy nylon key strap. Available with either the full-sized 3.125" carabiner, or the "mini" 2.25" carabiner (dimensions not including the strap). Add reverse side engraving for only .15 per. Ready in just 3 days! For multiple colors please call 877.204.9511 or email to order. Combinine our Carabiner Keychains with a sturdier, rugged nylon strap for an always popular combo. Choose from nine colors, crisply laser engraved. Packaged bulk (loose 100 to a bag).